Did you know that buckwheat noodles are gluten free? Although "wheat" is in the name, buckwheat is not related to wheat. Buckwheat Fagopyrum esculentum is not part of the cereal grain family but is from a broad leaf plant in the Polygonaceae family. Soba noodles, made from 100% buckwheat, are suitable for those on a gluten-free diet as long as they haven't been cross contaminated during processing. I love the chewy texture of these noodles. I prefer them over Udon noodles and always have a package of them in the pantry. Soba noodles are low in fat and high in protein and contain all the essential amino acids. They also contain thiamin, folate niacin, manganese, magnesium, phosphorus and iron. It's getting cold and although one third of my diet still consists of raw fruits and vegetables, most of my diet, in the cold months, is cooked. I almost always have a pot of hot soup on the stove. Here's a recipe that can stand alone with just the veggies, shiitake mushrooms and soba noodles but you can also add slices of tofu or the protein of your choice to make it even more hardy. You can make this meal using just 2 pots: a 3-quart saucepan to make the broth and a 5-quart soup pot. Make the broth. Remove the stems from the shiitake mushrooms and place them and all of the broth ingredients in a 3-quart saucepan and bring to a boil. Reduce heat, cover and simmer for 30 minutes. Set aside. It's easy to make your own broth. This broth makes use of the mushroom stems and the top and bottom of the onion. While the broth simmers, prepare the vegetables and noodles. Place a steamer basket in a 5-quart soup pot filled with 2 inches of water. Place the broccoli in the steamer basket and cook, covered, on high heat until fork tender. Remove the broccoli from the pot immediately so that it doesn't overcook. Set aside. Cut the broccoli into very small florets. Steam briefly until fork tender and remove from heat. Remove the steamer basket from the pot and fill the soup pot with fresh water. Boil water and cook the soba noodles according to the directions on the package. Drain the noodles in a colander and rinse them well as soba noodles can be quite starchy. Set them aside. Wipe out the soup pot with a towel to dry. Heat the sesame oil in the soup pot and cook the onions on medium heat until they begin to soften, about 4 minutes. Add the peppers, shiitake mushrooms and carrots and cook for another 4 minutes. Cook the onions, peppers, mushrooms and carrots. Strain the broth and pour it into the soup pot along with the slices of jalapeño. Simmer until the carrots are tender, about 10 minutes. Add salt if desired. Add the cooked broccoli and soba noodles to the soup pot and heat for several minutes until warm. Divide into 4 soup bowls, top with fresh cilantro and serve. Per serving: 316 calories, 5 g total fat, 0.6 g saturated fat, 51 mg omega-3 and 1.6 g omega-6 fatty acids, 11 g protein, 60 g carbohydrates, 8.3 g dietary fiber and 717 mg of sodium (with the additional 1/2 teaspoon of salt - 427 mg sodium without it). Lentils form the base for this meaty tomato sauce. Spaghetti squash is a good gluten free alternative to pasta. When you simmer cooked lentils in a rich, seasoned tomato sauce they not only provide a meaty texture but they also deliver protein, vitamins, minerals and fiber. Let's compare a cup of lentils to a 3 ounce serving of ground beef. One cup of cooked lentils has the same number of calories as a 3 ounce serving of ground beef but has only 5% of the total fat and essentially no saturated fat or cholesterol. They are pretty comparable in protein but lentils deliver more than half of your daily fiber requirement while ground beef provides zip. And don't fear lentils' carbs. They are the complex kind that keep your blood sugar stable and slowly provide glucose to your cells. Lentils are packed with folate, a B vitamin critical for heart health, the production of new cells and especially important for pregnant women. While 1 cup of lentils provides 90% of your daily requirement of folate, ground meat only provides 3%. And while the non-heme iron found in lentils is not absorbed as well as the heme-iron in the ground beef, well - there's 3 times as much of it so not to worry! 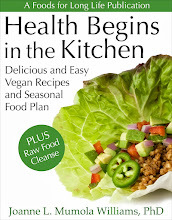 Ground beef has the one advantage of providing vitamin B12 which lentils do not. Spaghetti squash is a wonderful alternative to pasta when you are trying to avoid some carbs and calories. It's also naturally gluten free. It's magical the way the cooked flesh turns into spaghetti strands. But I love this lentil "meat" sauce on pasta too - either whole wheat or, if you are avoiding gluten, served on any gluten free alternative like Tinkyada brown rice spaghetti pasta. Prepare the spaghetti squash. Cut in half, scoop out the seeds and place in a large pot with one or two inches of water. Cover and steam until a fork barely penetrates the flesh, about 15 to 18 minutes. Don't overcook or it will turn to mush. Remove the spaghetti squash from the pot immediately. Cover and steam until cooked. Using a fork, gently pull the squash away from the sides uncovering little spaghetti-like strands. Continue to do this until all the squash is removed. Place the spaghetti strands on a platter, cover to keep warm and set aside. Heat the oil in a large saucepan and cook the onions and peppers at medium heat until soft, about 5 minutes. Add the chili flakes and garlic and cook until the garlic is fragrant, 1 or 2 minutes. Add the basil, oregano, lentils and salt and stir to combine. Add the tomato sauce and simmer until the flavors blend and the sauce thickens, about 10 minutes or more. If you are using this topping on regular pasta, this would be a good time to cook the pasta. Serve on top of spaghetti squash (pictured above) or stir together with whole wheat or gluten free pasta. Per serving (on spaghetti squash): 293 calories, 6 g fat, 1 g saturated fat, 201 mg omega-3 and 635 mg omega-6 fatty acids, 12 g protein, 52 g carbohydrates, 14.9 g dietary fiber and 1050 mg sodium*. Per serving (on whole grain pasta): 390 calories, 5 g fat, 0.7 g saturated fat, 93 mg omega-3 and 862 mg omega-6 fatty acids, 19 g protein, 74 g carbohydrates, 15.2 dietary fiber and 1002 g sodium"
* sodium can be reduced by using "no salt added" canned lentils or cooking your own lentils. Wild Rice And Aduki Bean Stuffed Acorn Squash Topped With Low Sugar Orange-Cranberry Sauce, A Great Vegan And Gluten Free Entrée For The Holidays! Stuffed acorn squash makes an attractive holiday entrée. Entertaining is far more complicated than it used to be. Besides people avoiding meat because of ethical or health reasons, far more people are passing on wheat, dairy, nuts, soy, etc. because of food allergies. If you are having a large holiday dinner for Thanksgiving, Hanukkah or Christmas, I can almost guarantee you that one of your guests will have some kind of eating restriction or preference. Always ask your guests ahead of time if they have food preferences or allergies so that it doesn't come as a big surprise when they arrive at your house and say, "oh by the way, I don't eat .....". It's best to know beforehand so that you can prepare something special or even ask them to bring a dish to share. Here's a recipe that avoids meat and most allergens and is elegant enough for your holiday menu. The aduki (also called azuki or adzuki) is the same bean used in red bean ice cream, commonly served in Japanese restaurants. It's a small and delicate red bean that is easier to digest than other beans with strengthening and balancing qualities. They are traditionally served at festive celebrations and are said to bring good fortune. I like buying them from Eden since they are organic and packed in BSP (bisphenol) free lined cans. 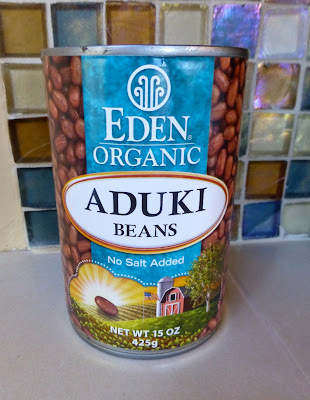 Aduki beans are small, delicate red beans. Here's a low sugar cranberry sauce flavored with orange juice and orange zest that is a great topping for this stuffed acorn squash recipe. But it will complement any Thanksgiving meal. Make it earlier in the day so it has time to cool and thicken. Or, make it the day before and refrigerate after it cools at room temperature. Heat the orange juice, zest and sugar in a small saucepan stirring until the sugar dissolves. Add the cranberries and bring to a boil. Reduce to medium heat and cook until all the cranberries pop and the sauce thickens (8 to 10 minutes). Remove from the heat and add stevia a few drops at a time until it reaches the desired sweetness. Don't add too much or it can become bitter. I usually add about 8 drops. Let the cranberry sauce cool at room temperature. It will thicken as it cools. Store in the refrigerator. Per serving: 66 calories, 0 g fat, 0 g cholesterol, 0 g protein, 16 g carbohydrates and 1.5 g dietary fiber and 1 mg sodium. Cook a mixture of wild and brown rice, according to manufacturers directions, enough to yield 2 cups of cooked rice. Meanwhile, cook acorn squash. Cut acorn squash in half and place on a cookie sheet or shallow roasting pan. Cover with foil and bake until a fork easily pierces the flesh, about 1 hour. While the squash is baking, heat the oil in a large sauté pan and cook the onions on medium heat until soft and slightly brown, about 5 to 8 minutes. Add the beans, soy sauce, agave nectar and black pepper and cook for several minutes. Turn off the heat and set aside. 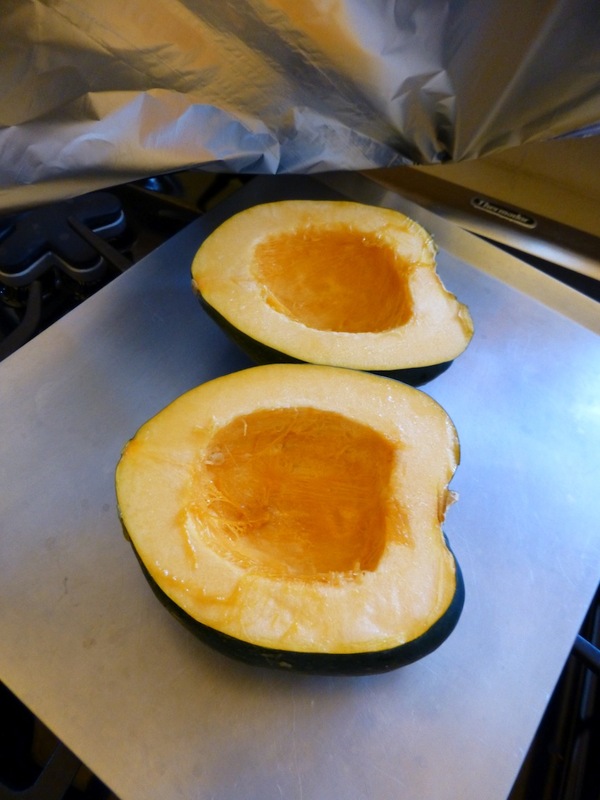 When the squash halves are cooked, remove them from the oven. Scoop out about half of the squash leaving the shell and about 1/2 inch of squash. Chop the removed squash into small pieces. Add chopped squash to the pan of beans. Stir in the wild rice mixture. Stuff the squash with the bean and rice mixture and cover with foil. Place in the oven and bake until warm, about 15 to 20 minutes. Serve with a tablespoon or more of low sugar cranberry sauce. Per serving: 369 calories, 3 g fat, 0.5 g saturated fat, 12 g protein, 76 g carbohydrates, 10.3 g fiber and 374 g sodium. Lactose Intolerant? Going Vegan? You'll Need A Substitute For Milk. Here's How To Select The Best Non-Dairy Milk Alternative! What's the best milk for your morning breakfast cereal? Do you get bloated or nauseous after eating dairy products or do you get gas pains or cramps in your abdomen? If so, you may lack lactase, an enzyme that is needed to properly digest lactose, a sugar found in milk and dairy products. An astounding 65% of adults worldwide lose the ability to produce this enzyme after weaning. The problem varies greatly with ethnicity. About 20% of North American whites have this issue while three out of four African Americans and about 50% of Latinos are lactose intolerant. Given that the average American consumes over 600 pounds of dairy per year, there may be quite a few people walking around out there feeling lousy! I personally cannot eat dairy without getting severe stomach cramps. Vegans and those who are lactose intolerant continually search for delicious and nutritious dairy substitutes. And now it's easier than ever. Years ago, all non-dairy milk products came in little boxes that sat on the shelf, unrefrigerated. Those products are still available and are quite convenient when you want to store them in your pantry or pop them into your lunch box. But today there are many "fresh" non-dairy milk substitutes that are found in the refrigerated section of your supermarket and they are quite superior in taste. Every week for the past month or so I bought a different brand. I have now tasted them all and analyzed them for their nutritional content. You may be quite surprised at what I found. 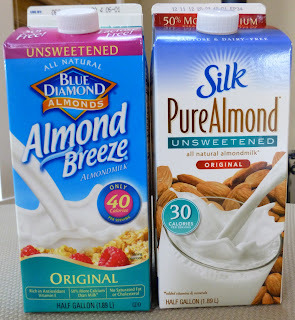 I tried 2 brands of unsweetened almond milk, Blue Diamond Almond Breeze and Silk Pure Almond. What sets almond milk apart from the others is their very low calorie count, Silk Pure Almond being the lowest with only 30 calories a cup. Nutritionally they were both very highly fortified with calcium at 450 mg per cup and also contained 50% of the daily requirement of vitamin E. They were the only milk substitute that has zero grams of sugar. Cow milk contains 12 to 13 grams of sugar per cup. Both almond milk brands contained more sodium than the other types of non-dairy milk, 150 mg to 180 mg per cup. I found almond milk to be absolutely delicious. 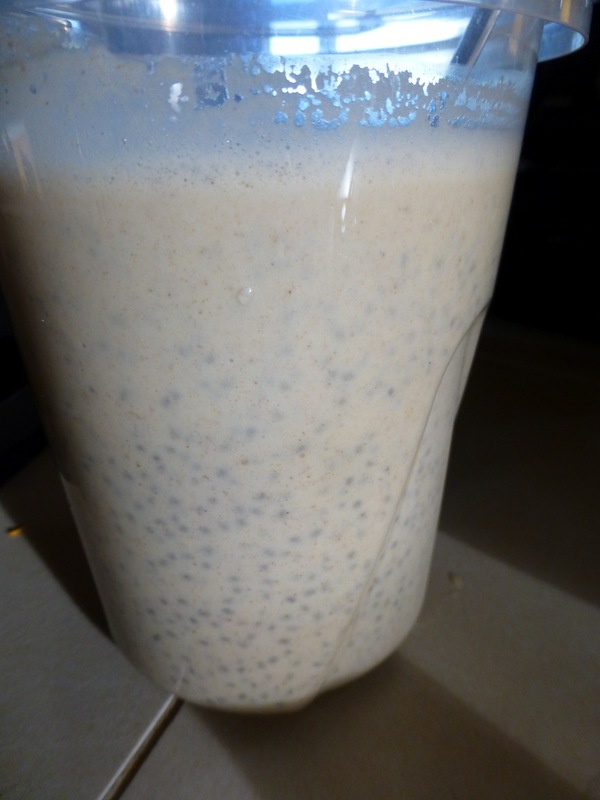 You can also make your own raw almond milk very easily if you have a high speed blender. 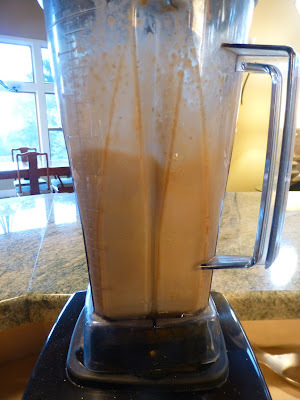 I've tried both Silk and Earth Balance soy milk and they are both creamy and delicious. They are also a significant source of protein, providing 7 grams per cup, while the other non-dairy milks have 1g or less. This compares very favorably with cow's milk which provides 8 grams per cup and has the advantage of not having saturated fat or cholesterol. Some avoid soy products because they fear that they increase the risk of breast cancer recurrence but recent data shows that soy might, in fact, reduce the risk. Warning: Soy milk can give you some gas - after all, it's bean juice! Introduce it into your diet gradually. I also make my own soy milk with a SoyaPower Plus. Vegans have been enjoying Rice Dream for years and now it's offered in the fresh, refrigerated version. It's thinner than some of the other milks but it is delicious. What surprises me the most about this product is that it's very high in calories (120 per cup) and contains a high amount of "natural" sugars (10 g per cup) - as no sweeteners are added. To compare, Silk Pure Almond contains 1/4th of the calories and zero grams of sugar. So if you are watching your weight, this might not be your best option. So Delicious makes some wonderful ice creams, coconut creamers and other products so I was anxious to try their dairy free coconut milk. It's hard to believe this thick and creamy milk has only 45 calories. I actually found the milk to be too thick for my cereal although it's great in a smoothie. It also is high in saturated fat (4 grams per cup). There are some who think that saturated fats from coconuts are not only safe but provide health benefits. 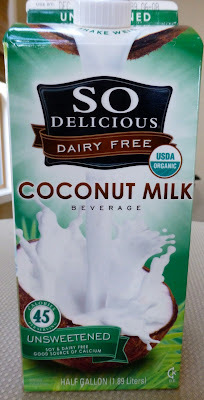 I'm not yet convinced of that and while I feel it is probably fine to enjoy this coconut milk beverage frequently, I probably wouldn't use it as my only source of non-dairy milk. That aside, I didn't actually enjoy it nearly as much as almond, soy or rice milk. There are many wonderful dairy free, gluten free alternatives to cow's milk for those of you who are lactose intolerant, vegan or on a low cholesterol diet. The lowest calorie products are almond milk and coconut milk. 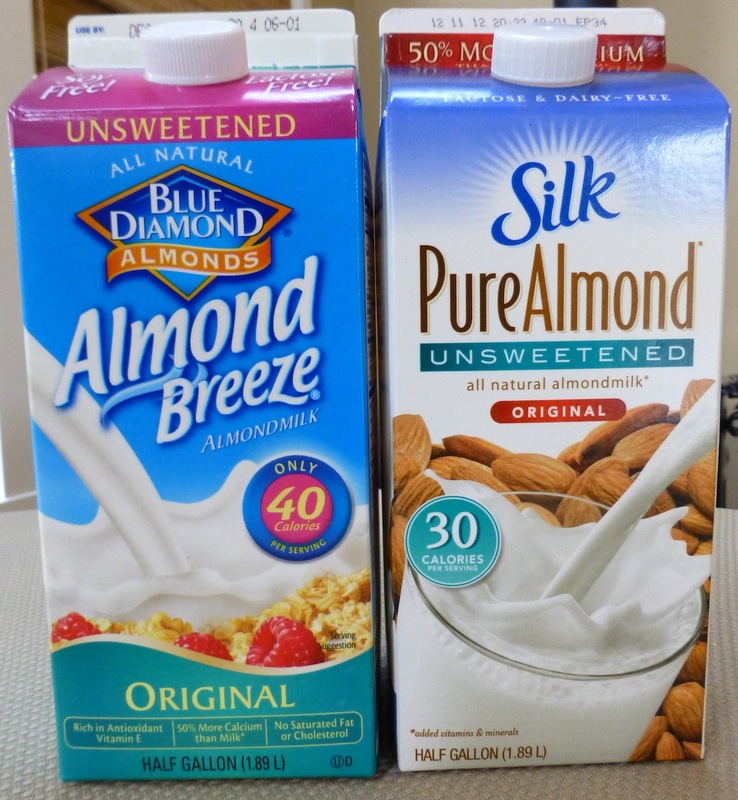 Silk PureAlmond Unsweetened almond milk has the lowest amount with only 30 calories per cup. The highest calories are from Rice Dream Enriched Refrigerated Original. Soy milk contains about the same as skim dairy milk. All of the non-dairy products contain a modest amount of total fat ranging from 2.5 grams to 4.5 grams per cup. All, except So Delicious Coconut milk, contain insignificant amounts of saturated fat. So Delicious Coconut milk contains 4 grams of saturated fat per cup. To compare, whole dairy milk contains 8 grams of total fat and 5 grams of saturated fat. Skim milk contains neither. There seems to be a race among our food providers to see who can load us down with the most calcium. I worry about that because I fear that people are taking too many calcium supplements . If your doctor has you taking 1,000 mg of calcium supplements a day and then you drink 2 cups of Almond Breeze, you just got another 900 mg of calcium. And that's not counting the calcium you are getting from tofu, greens, fortified orange juice, etc. So be aware of what you are consuming from all sources. Also, you should note that for the optimal absorption of calcium, you need to consume magnesium at about a 2:1 or 1:1 ratio of calcium to magnesium. Fortified foods, such as these milk products, add lots of calcium but don't add much magnesium. Dairy milk has lots of sugar (12 to 13 grams per cup) - that's why people are lactose intolerant - they can't digest the lactose sugar. Except for the Original Rice Dream, all the non-dairy milk alternatives are very low in sugar with 1 gram or less per cup. Rice dream contains a whopping 10 grams per cup. If you need a good source of protein, soy milk provides 7 grams per cup, nearly as much as dairy milk. The others tested do not provide a significant amount of protein. All dairy and non-dairy milks have about 80 to 120 plus mg of sodium per cup except for So Delicious Coconut Milk Beverage which only has 15 mg.
Of course at the end of the day you have to love the taste of the product and that is something you have to determine for yourself. (I guarantee you that all of these will beat the taste of non-fat, skim milk!). You also will have to pick one that satisfies your dietary needs. I hope this paper helps you in the search for YOUR perfect non-dairy milk alternative!